The seaside city of Brighton makes for an ideal quick trip thanks to its compact size. There’s enough here to keep you busy for several days, but if you’ve only got 24 hours you can still squeeze in a lot without feeling too rushed. Ready to explore the sights and sounds of Brighton? Follow these expert tips from our local Brighton guides for the best things to see, do and eat during a 24-hour visit. 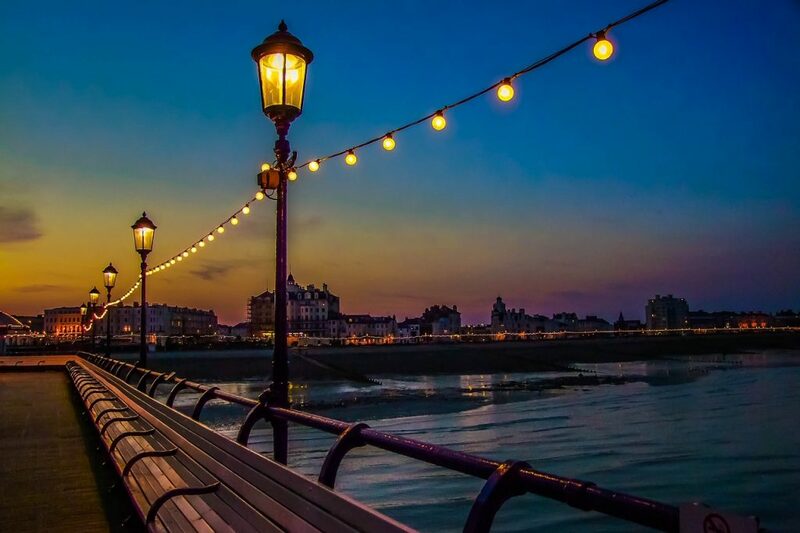 Start your visit to Brighton with a walk along Hove promenade. The sun is just coming up and the air is clear, creating a stunning (and Instagam-worthy) light. The winds are usually light in the morning, the air is fresh, and the sea is often at its calmest. People will be making their way to work, either on foot or on some kind of wheeled device — bike, skateboard or roller blades. Check out the famous beach huts that sit in front of the magnificent Hove Lawns and Regency buildings. Most breakfast places don’t open ’till 9am in Brighton, but you should be able to grab a coffee and some breakfast from Meeting Place Café, which opens at 7am. If you happen to be there earlier, beverages are usually available starting at 6:30am. Carry on walking along the seafront until you get to the Brighton Pier. The gentle stroll should take about 20 minutes. 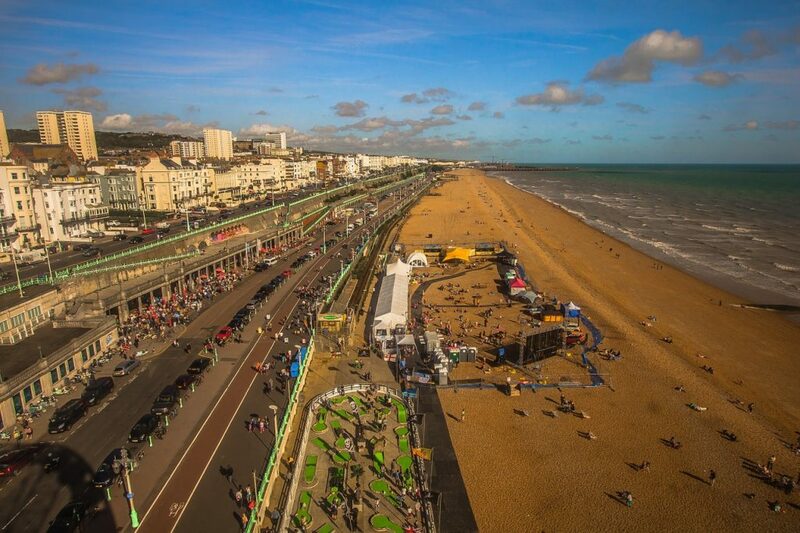 Assuming you aren’t too tired, one of the best ways to see the sights in Brighton is on two wheels. Either explore on your own by renting a bike courtesy of Brighton Beach Bikes and take a ride out to the White Cliffs east of Brighton Marina. Or you can take Urban Adventures’ White Cliffs of Brighton tour that leaves at 10am. The scenery is stunning as you take the Undercliff Walk east of the marina. The crowds will be quieter at this time of day and it’s the perfect way to set up the rest of your visit. With the sun reflecting off the white cliff faces and the blue sea lapping over the chalk reef, you have to pinch yourself to make sure you haven’t been transported to a Greek island. What better way to refuel after a bike ride than with a plate of fish and chips on the beach?! On busy days, you might want to grab a seat wherever you find one, but try Lucky Beach Café first. They’re known for using local, seasonal and organic ingredients whenever possible. If Lucky Beach is too crowded, you can try the The Regency Restaurant, one of the oldest seafront restaurants in Brighton. If you want the complete experience, think about grabbing a take- away and eating right on the pebble beach. Be careful of the seagulls though! Spend the afternoon exploring the Lanes and the North Laine area of Brighton, a short walk from the seafront. The Lanes was once a fishing village and is now a charming maze of alleyways down which you’ll find jewellery shops, antique stores, and independent boutiques. It’s single file down most of the lanes, which is good as it forces you to gaze into the shop windows. Independent retailers and cafés are what the North Laine area is all about, known as Brighton’s bohemian quarter. Here you’ll find over 300 shops to browse, as well as some beautiful street art. Visit the Brighton Museum and/or the Royal Pavilion. The Pavilion is a real-life Royal palace in the heart of the city, styled on the Taj Mahal in India, and is between the Lanes and North Laine. You’re probably getting hungry after all that sightseeing. Try La Choza in the North Laine. This spot serves great Mexican street food and it’s a good idea to get there early as you likely won’t get in otherwise. You can’t book a table, so just turn up and if they’re full, you can go to a neighbouring pub (we recommend The Basketmakers) and wait for a call that your table is ready. Following dinner, head down to the beach to watch the sunset from the top of the i360 Tower (the world’s tallest moving observation tower), or if don’t like heights, see the sunset on the beach. Remember in the summer the sun goes down very late so you’ll have plenty of time. For travellers on a short visit, we’d recommend having a layover that will allow you to spend two to three hours in the city centre, and another hour for travelling to and from the airport and building in enough time to make your flight without worrying about rushing. The best way to get from the airport to the sites is by taking the train from Gatwick, which takes around 30 minutes. If you want to see Brighton in two hours in the morning or afternoon, take a walking loop tour of the city. Walk straight down to the seafront from the train station, head east towards the pier, just before the pier turn right up East St. and then meander the back streets back to the station. You can see everything that makes Brighton what it is in a short space of time, stopping for something to eat before hopping back on the train. If you’re in Brighton for an evening or nighttime layover, head for food and drinks in the North Laine or try the Sussex Yeoman, a popular pub just to the right of the train station for amazing food. The North Laine is known for its bohemian atmosphere, and centuries-old pubs intertwined with modern independent cafés and restaurants. Catch some live music at the Green Door Store, a bar and live music venue underneath the station before heading back on to your train to the airport.